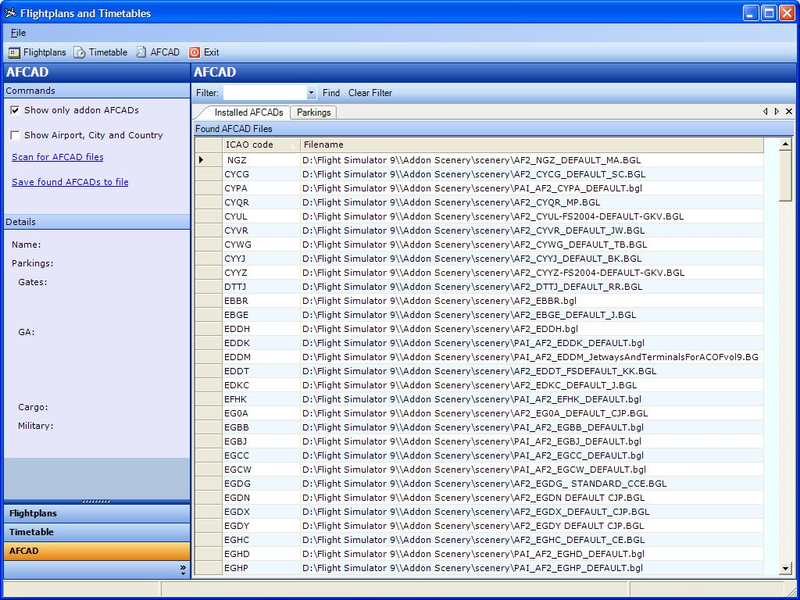 Aircraft Analyzer 2005 (ACA2005) is a program for analyzing and viewing your Flight Simulator 2004 (FS9) installation in several ways. 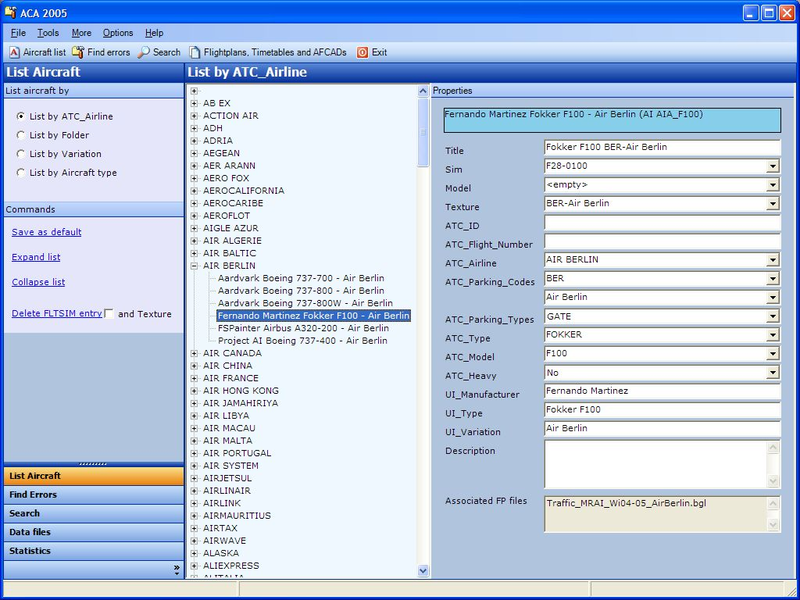 In the main screen of ACA2005 there are several options. List Aircraft. This will show all the aircraft installed in FS9. Search. This will let you search for text in the installed aircraft.. These will now be described in more detail. This screen you will see after starting ACA2005. 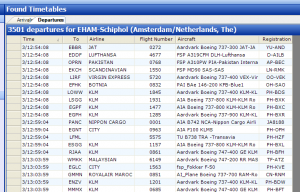 It shows you a list of all installed aircraft in your Flight Simulator. You can show the installed aircraft in four different ways as can be seen on the screen shot. You have the opportunity to save one of the list as your default. The list can be rescanned by pressing F5 or choosing the menu option. Another option is to remove the selected aircraft from FS9. After selecting the link and the confirmation, the corresponding FLTSIM section in the aircraft.cfg file will be deleted. When the ’and Texture’ box is checked the corresponding texture map will also be deleted. After this ACA2005 will automatically rescan the installed aircrafts. 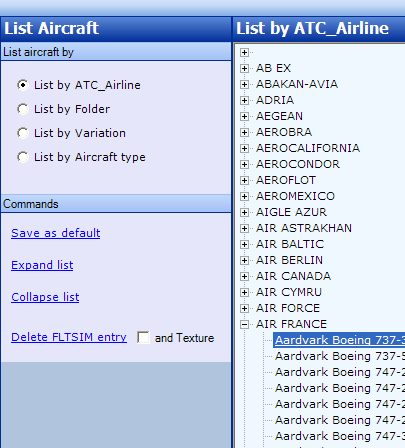 The ‘List by ATC_Airline’ is the default list. 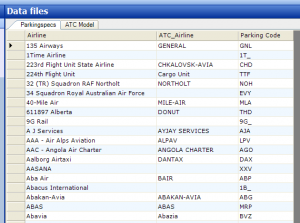 Aircraft are listed/grouped by the contents of the ATC_Airline value in the FTLSIM section. 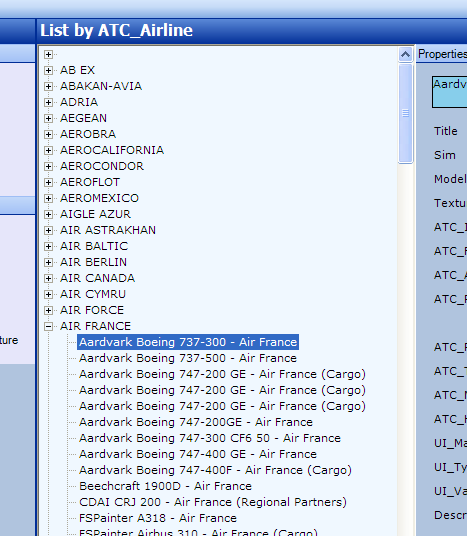 The list then shows the installed aircraft by UI_Manufactures, UI_Type and UI_Variation. 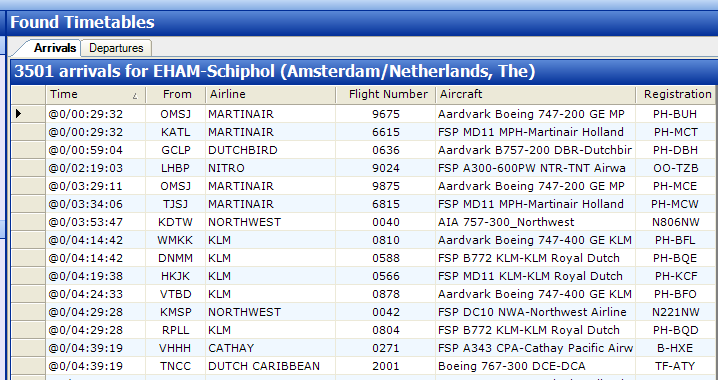 When selecting an aircraft from the list the properties of this aircraft will be shown. 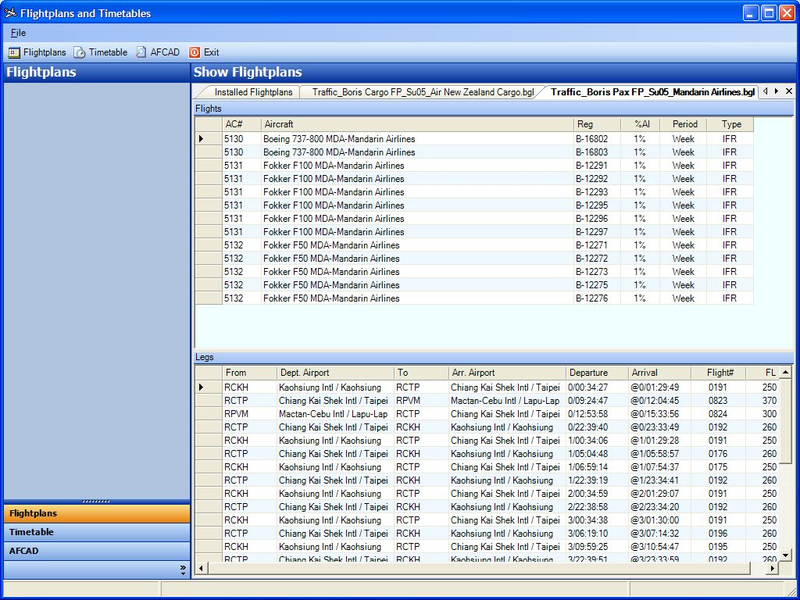 The values shown are read from the FLTSIM section. The combo-boxes from Sim, Model and Texture will show only those possible values for this aircraft. 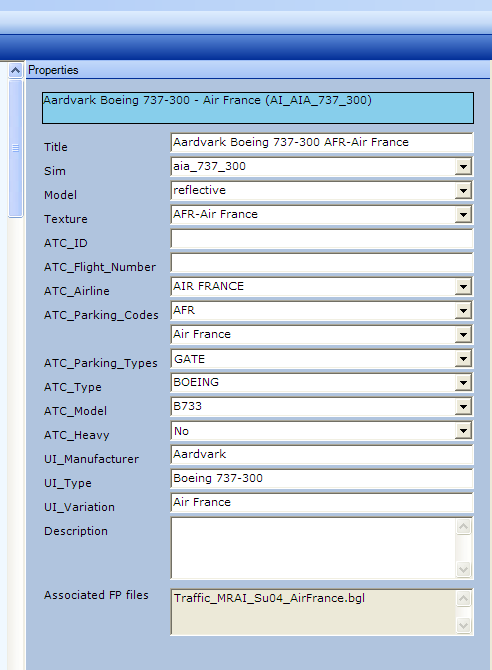 The combo-boxes for ATC_Airline and ATC_Parking_codes are coupled in such a way that when choosing a value of one of them ACA2005 will try to find the other corresponding values. When changing one of the values you can save these back to the FLTSIM file. 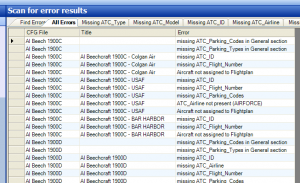 Also one can see if the selected plane is associated with a Flightplan and in which BGL file it was found. It is possible that more than one BGL file with the same name is listed. In that case the aircraft is used more than once on the same Flightplan. 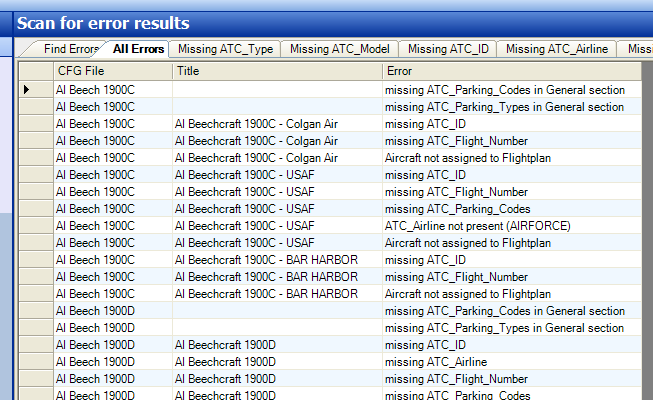 On the Find Errors tab you can search for a couple of possible errors in your Flight Simulator installation. After selecting the errors to search for you can save these as your default search. Next time you start ACA2005 this search will be done immediately after initialising. The found errors can be saved to a HTML file for instant printing. The possible errors ACA2005 can search for can be seen on the screen shot below. The ‘Missing’ errors search for empty lines in the FLSIM sections of the installed aircraft. 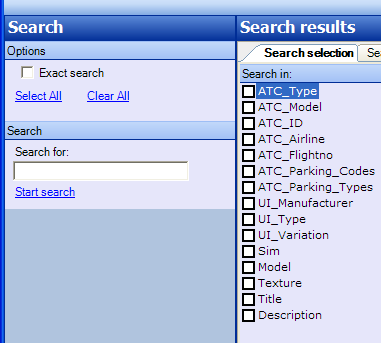 ACA2005 uses a couple of standard lists (Airlines, Models, Types) and can search for entries that are not in these lists. 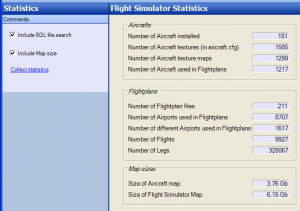 For the installed Flightplan you can get a list of installed aircraft that are not used in a Flightplan and of aircraft present in flightplans that are not in FS9. This could be due to typing errors in the title section. Titles have to be unique in FS9 otherwise FS9 does not know which aircraft to use in the flightplans. ACA2005 checks already for this error when the program starts. 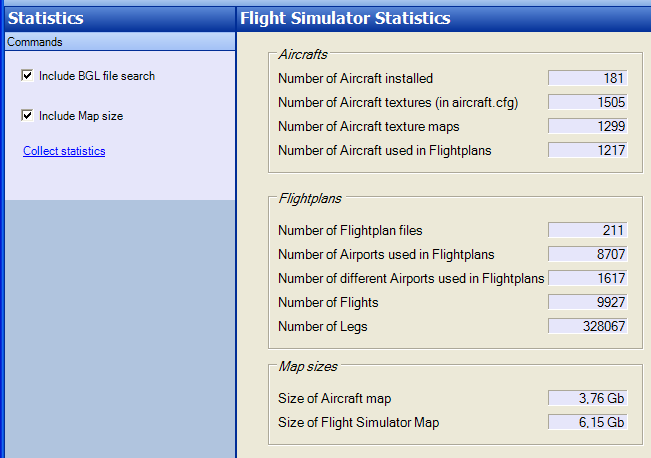 Another possible error could be that the numbering of the FLSIM sections is not correct. There could be missing section numbers or you may have duplicate numbers. 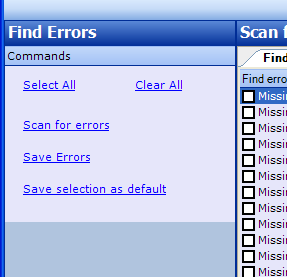 After doing a scan you can get a list of the found errors. All the errors have their own list and there is one list for all the errors. 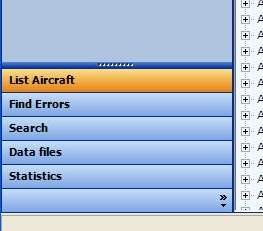 Double clicking on an error will open the corresponding item in the aircraft list or it will open the corresponding aircraft.cfg file in Notepad and in some cases ACA2005 will start Windows Explorer. This option is used for searching text in the listed sections. After searching for the word ‘france’ you might get this list. When doing an ‘exact’ search the complete word has to be found/present. At the moment these list only two files. The parking specs file and the ATC_Model file. A next version of ACA2005 may contain more data files together with the possibility to change them. Scanning this will give you some useful information about your FS9 installation. Selecting this option from the toolbar or from the menu will open a new window. 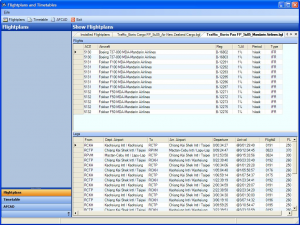 The option Flightplans will show you the installed traffic files with the file date. The columns can be sorted by clicking on the column header. 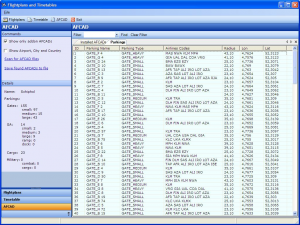 ACA2005 uses the scenery.cfg file for searching the BGL files. 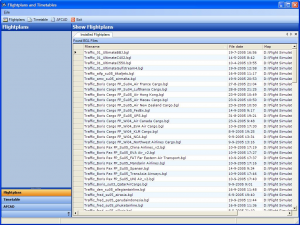 When double clicking on a traffic file ACA2005 will read this file and will show you the Flights and corresponding legs. 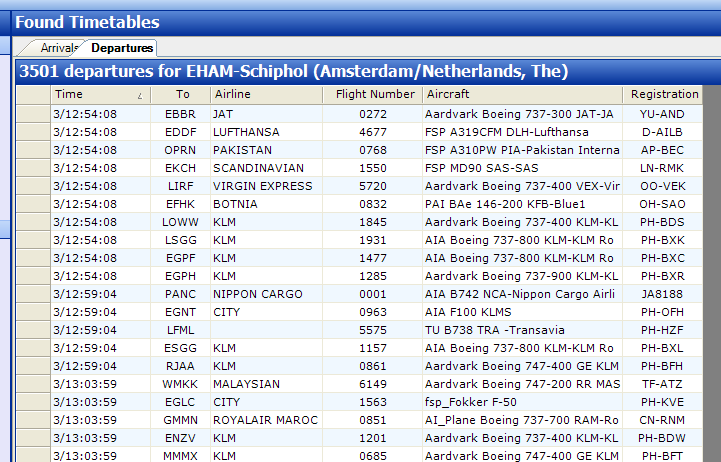 The Timetables option generates a list of arrivals and departures at a certain airport. You have to use the ICAO code of the airport for a search, also you can search for a complete week or a specific day and time interval. GMT. 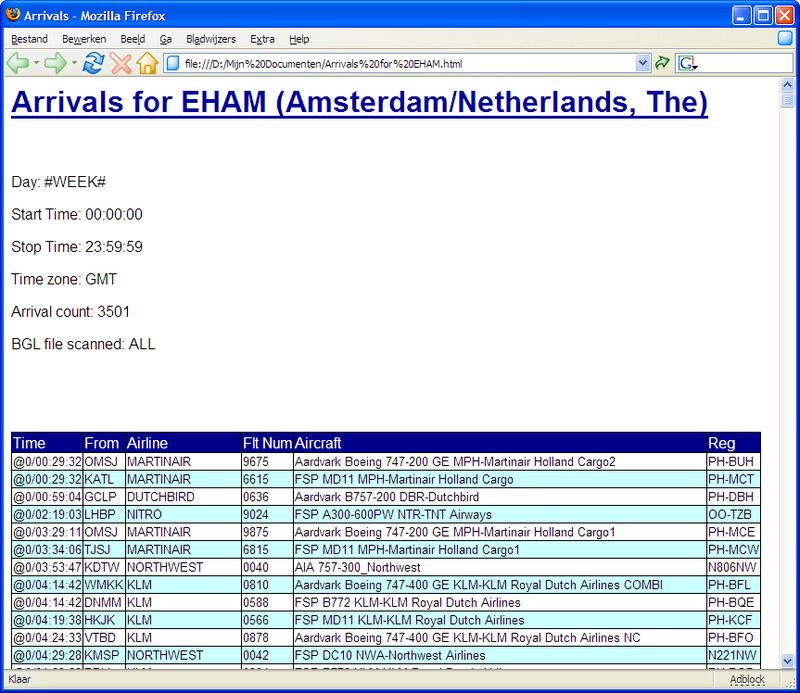 This will show the arrival and departures times between the selected GMT times. ICAO to Airport. This will display the official airport name instead of the ICAO code in the timetable. When city and country is selected these values will also be shown. Show only flight to/from. Here you can type one or more ICAO codes (separated by a comma or space). BGL file to scan. 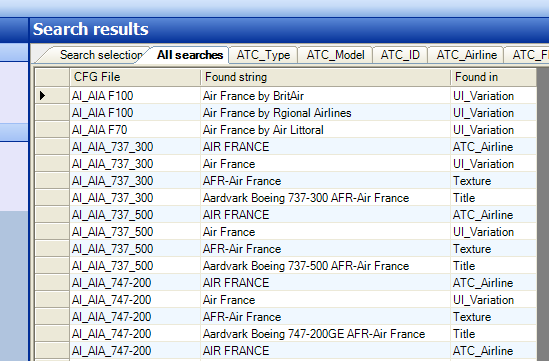 Normally ACA2005 will scan all Flightplan files. If you are interested in a list of only one bgl file this option may be used. The searching for the results can take some time. 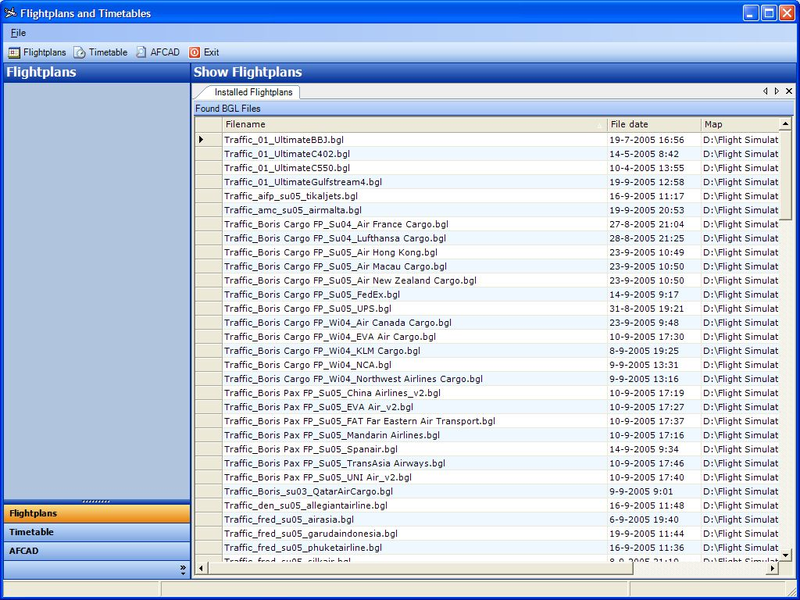 ACA2005 is optimized in this way that it first will check if a flightplan file has the ICAO code present before it will search the whole file for possible legs. If one has multiple Flightplan files this will speed up the search a lot. If one uses only a couple of these files the searching last longer. These lists can be saved to an HTML file for further processing/printing. 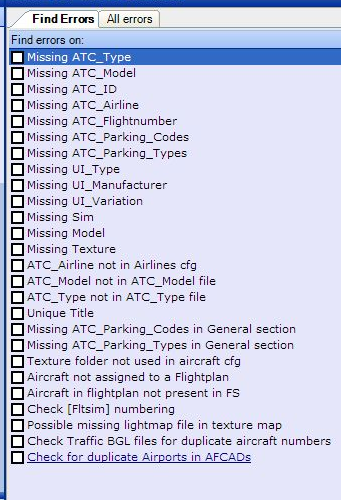 Here one can get a list of all AFCAD’s installed in fs9. 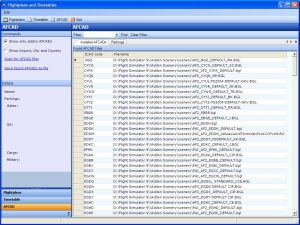 ACA2005 uses the scenery.cfg file to search for possible AFCAD files and list them here. When ‘Show only addon AFCAD’s’ is checked ACA2005 will omit the default AFCAD file’s in the list. 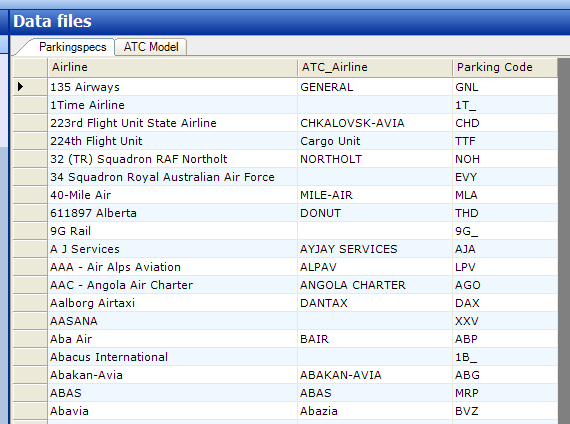 One can filter the list by typing an ICAO in the filter box and click on find. 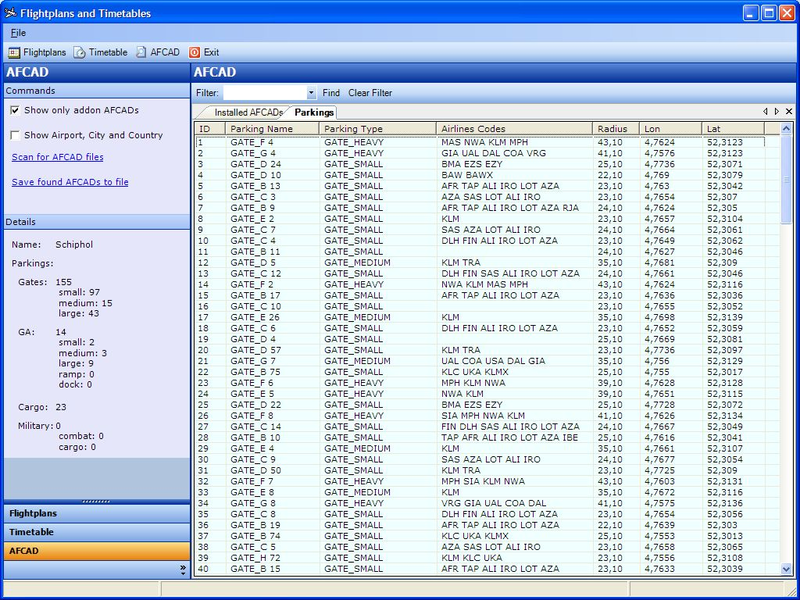 When double clicking an AFCAD ACA2005 will scan the AFCAD and will show you some information stored in the selected AFCAD. See the screenshot for the information. ACA2005 will show you in the left pane the total amount of gates and parkings and also the amount of the different types. In the right pane it will show you extended information with the names and the parking codes assigned to the specific gates. A small utility is included under the extra menu. “Renum all fltsim” lets you renumber all the FLTSIM sections it can find in all of the aircraft.cfg files at once. I sometimes forget to change the FLTSIM entry number when installing a new aircraft/texture. It will backup your aircraft.cfg file to aircraft.cfg.ACA before making changes. Use this function at your own risk. 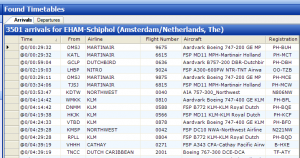 Also one can make an airport file out of a flightplan file. Just select the flightplan file and press the button. 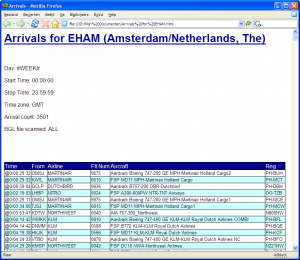 The airport file will be saved in the same directory as the Flightplan file. ACA2005 has two possible options. When ACA2005 starts it will try to find the fs9 map from the registry. 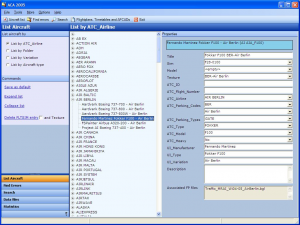 If it can not find it one has the opportunity to select the fs9 directory manually. 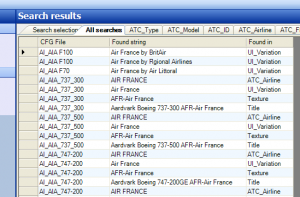 ACA2005 uses some config files for ATC data. Instead of using these files it can use the information stored in the voicepack file of fs9. When you use the EditVoicepack program than the ATC data is also updated. 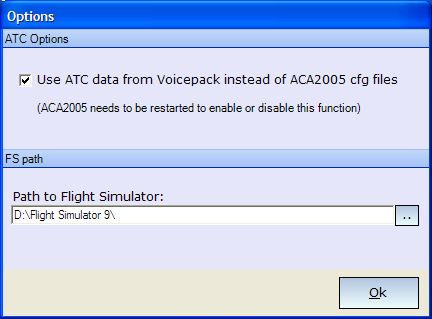 Be sure to first start ACA2005 before starting FS9, because FS9 locks the voicepack file so ACA2005 can not read from it. Further more if you have multi copies of Flight Simulator present you can alter the path to FS9.exe and if you restart ACA2005 the program will use that path to work with. My thanks to the beta testers for testing this program and for their ideas to improve it. Lee Swordy for sending me the source code of TTools v2 which gave me the opportunity to build the Timetable section. Lars Mollebjerg for help with the structure of the FS9 voicepack file. Also special thanks goes to Graham Jackson and Tom Lenaerts who were already involved in the very early stages of ACA2005. ACA2005, and this document are copyright © 2005 Peter van der Veen. ACA2005 is freeware and may not be distributed for commercial purposes ON CD OR ANY MEDIUM FOR ANY KIND OF FEE, INCLUDING THE COST OF PRODUCTION, MATERIALS OR POSTAGE or posted in the public domain without the author’s consent. This software is provided ‘as is’, and usage of it is the responsibility of the user. I accept no responsibility for any damage this program might cause.